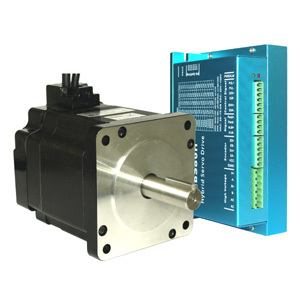 Traditional stepper motor drive systems operate open loop providing position control without feedback. However, because of this, loss of synchronisation can occur between commanded and actual steps. Monitoring position using an optical encoder can help but only highlights position loss rather than correcting it! An application requiring real-time, closed-loop performance throughout the move has previously required engineers to choose much higher cost/complexity servo systems which in many applications lack the high torque feature of stepper motors. Hence, expensive planetary gearboxes have to be added. Our new ES series closed-loop stepper drives and motors system overcome this weakness by using high resolution encoders to update the motor position every 25 micro-seconds, ensuring controlled, real-time position accuracy without losing steps. Different from the constant current output of an open-loop stepper system, output current in ES stepper drives is optimised - changing based on load position. Note: drive and motor package (ES-D808 + ES-M23480) in stock for short time delivery. We recommend to use our power supply SPS600-48 to power our ES-D808 series closed-loop stepper drives and motors system. For more detailed information, please click the link below o download the complete technical datasheet. Please contact our sales team for pricing if you need the items for the quantity over 10pcs. RSP-320 and SPS series switching mode power supplies with universal AC input /full range of 85-264VAC to provide 24V/ 36V/ 48V/ 60VDC output voltage for the output current 0-12.5A.